Our Whole-Grain Oat Flour is non-GMO and Kosher, and works as an excellent wheat flour substitute in whole grain bakery items like cookies, pancakes, and quick breads for light, moist, and flavorful results. Honeyville's Whole Grain Oat Flour is made up of pure oats. The oats are milled from triple-cleaned, specifically selected oats grown in the US and Canada to produce a premium quality flour. Some noteworthy facts about whole oats is that they’re high in dietary fiber, protein and good fats. Whole Grain Oat Flour is an oat groat that has been steamed and ground to produce a stable flour. 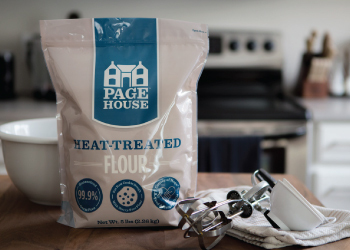 This professional-grade flour contains little to no gluten, and therefore must be combined with a leavening agent for those applications that require a flour to rise. Oat flour blends well with other products and has a unique, natural flavor that is detectable even after mixing. 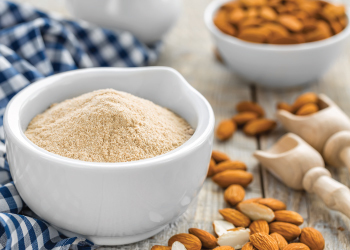 Honeyville Oat Flour is an ideal ingredient for baked goods such as pie crust, muffins, and waffles. In addition to its conventional use, Oat Flour can be used as a thickener for homemade gravy, frosting, batters, and soups. Turn an otherwise flat dressing into a culinary masterpiece without taking away from the intended taste. Whole Grain Oat Flour is a great option for maintaining a healthy cholesterol level. Bake your favorite pastries without worrying about overloading on carbohydrates. Shelf-Life: Oat Flour will store for 1 year in a sealed 50 pound bag under ideal storage conditions (cool, dry place). Uses: Oat Flour is used as a partial or complete wheat flour substitute in many cookie, pancake, scone, and bread recipes where a high quality, low-gluten flour is required. Keep in mind, for leavened breads oat flour will need to be combined with either a flour with some gluten to it, or a structural element like eggs, as a result of a lack of gluten content in oats. Packaging: Honeyville Whole Grain Oat Flour is available in bulk 50 pound bags. Packaging may vary. Country of Origin: USA and Canada.